DOUBLE the working life of your Designated Smoking Area Warning Signs by adding 3M Protective Overlay Film (POF)! 3M’s high-tech POF protects sign faces against fading caused by the sun and harsh weather—and makes graffiti and sticker defacement damage easy to clear away without harsh abrasives. 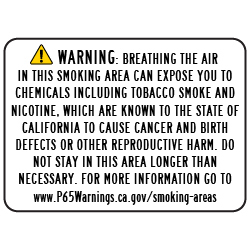 The designated smoking area warnings must be provided on a minimum 8½ Inch by 11 inches sign posted at the entrance to and within the exposure area, in no smaller than 22-point type.